Thank you for volunteering for the Festival of Trees! Without our Festival Volunteers, we simply wouldn’t be able to run the Festival events. Our Festival Volunteers are instrumental in providing an amazing experience for the young readers and adult chaperones that attend this event. 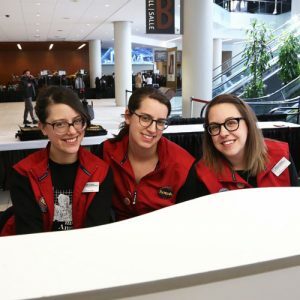 Here is all the information you need to have a great volunteering experience at the Festival of Trees! The Festival will take place from 10 a.m. to 2 p.m on May 8 at the The Aud (400 East Ave., Kitchener, ON). Full descriptions of duties will be available after May 1. Shifts are 6 hours on the day of the Festival and will run from 8:15 a.m. – 2:30 p.m. Duties are rotated among all the Festival Volunteers when possible. Festival Volunteers will have 30 minutes for lunch. Please wear RED, if possible. 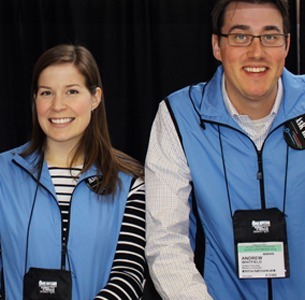 Generally, we provide red vests to Festival Volunteers and Forest committee members, though we may not have enough vests for all Festival Volunteers. We encourage all Festival Volunteers to wear comfortable shoes and casual clothing, as Festival Volunteers will be on their feet for much of the day. The Festival has ceremonies, activities, and workshops, inside and outside. Listed on the website you will find a detailed schedule of what is happening. Please familiarize yourself before you arrive and you will be given your posting when you arrive. Coffee, water, and juice will be available in the Volunteer Headquarters throughout the day. There will be a limited catered lunch. Please feel free to bring your lunch. You will have a break during your Festival Volunteer hours for about 30 minutes. Download the Festival of Trees mobile app that has all the schedules and activities. Download the EventMobi app through the Apple App Store or Google Play Store. Open the EventMobi app and in the search bar, search for “festival2019”. Click on “Get the App” and get access to all information on the Festival of Trees.